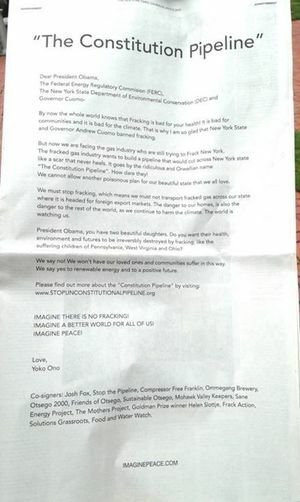 Gasland posted on facebook a picture of an ad against fracking, pipelines, and LNG export in the New York Times 9 July 2015 by Yoko Ono, Gasland, Food and Water Watch, and many other groups. You can sign onto that letter here. By now the whole world knows that Fracking is bad for your health! It is bad for communities and it is bad for the climate. That is why I am so glad that New York State and Governor Andrew Cuomo banned fracking. But now we are facing the gas industry who are still trying to Frack New York. 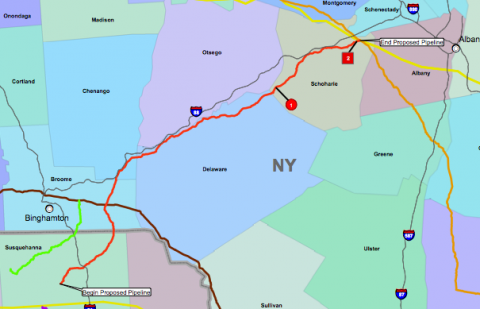 The fracked gas industry wants to build a pipeline that would cut across New York state like a scar that never heals. It goes by the ridiculous and Orwellian name “The Constitution Pipeline”. How dare they! We cannot allow another poisonous plan for our beautiful state that we all love. Lock your gates and call the sheriff and a lawyer if you see any signs of pipeline trespass, and complain to the state Attorney General, advises someone dealing with Williams’ Constitution Pipeline, and since Sabal Trail has already had a criminal trespass trial, we can’t expect them to be any better. Just because you’re on holiday the rest of this week, don’t assume the pipeline company is. And you’ll probably need an attorney for those eminent domain lawsuits if Sabal Trail gets a FERC permit, so file your motion to intervene or ecomment today. “Supporting the pipeline proposal as it stands amounts to surrendering our future to the petroleum industry.” That about sums it up, both for Kinder Morgan’s Constition Pipeline Northeast Direct project (NED) through Pennsylvania, New York, and Massachusetts, and for Spectra and FPL’s Sabal Trail pipeline through Alabama, Georgia, and Florida. The proposed pipeline would reportedly run beneath 55 private properties in Columbia County if it’s approved by federal regulators. The property owners would have to grant rights of way to the company. Neither the towns nor the county could intervene. The editorial doesn’t really buy that last: it laster asks local governments to intervene. Song: We all know FERC’s a Rubber Stamp Machine! We’ve all seen it here in Alabama, Georgia, and Florida, and our allies from New York went to FERC in DC to sing it: FERC’s a rubberstamp machine! We all know FERC’s a Rubber Stamp Machine! Recorded the 1 May 2014 (day of Minisink trial at the DC Circuit Court of Appeals). FERC’s rubberstamp machine may yet be held accountable by the citizens, and by other government agencies and courts that are taxpayer-funded, not by the industries they regulate like FERC. A court officer was asked if similar hearings were always as crowded. “Never,” he said. This is a trend that’s building. Before Spectra, the average number of interveners on any project was about 19. Now, it’s typical for there to be 300-500 interveners, and for thousands of comments to be filed. Lately, activists are getting under FERC’s skin even more, showing up repeatedly at hearings, Commission meetings, and soon, a rally in front of their offices.